Have you ever stopped in your tracks at a trade show just to take a closer look at a beautiful booth? I know I have! A well-designed booth can pull attendees in. And as an exhibitor competing with hundreds—or even thousands—of other brands, regularly improving your custom trade show booth design is a great way to grab attention. That’s important, because there are a lot of new potential customers at your shows. According to the Center for Exhibition Industry Research, the vast majority (92%!) of attendees are there to learn about what’s new in their industry. 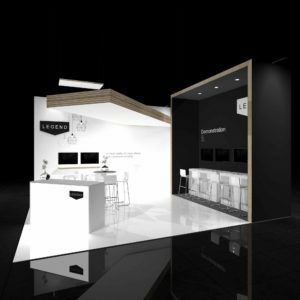 This custom trade show booth design was based on Legend 3D’s brand philosophy and based on making the maximum impact in a 20×20 space. We customized the turnkey booth to ensure it had a with a unique, high-end look. The multimedia screens were placed for high visibility, contributing to this custom booth’s sophisticated feel. Fun fact: We only had 14 days to plan, build and install this crowd pleaser! Google AI needed to stand out and effectively use their brand colors in an eye-catching way. Sometimes visual simplicity is the best way to get noticed at trade show. This booth is anything but typical! Kyon’s high-tech dog collar and app was debuting in the U.S. and they needed to make an impression at the ultra-competitive CES Expo without endangering their ROI. This booth told their brand story beautifully, with minimal text and striking visuals. You could understand what their product was about just by looking at the booth and it was an instant way to connect with trade show attendees and start discussions. Trade show tip: an uncluttered space with minimal furniture and visual elements has a great ambiance and can actually stand out in the busy background of the expo. TNA partnered with Exponents to create a look that would stand out at the massive Pack Expo! A raised platform and clean look did the trick and left a lasting impression. We think the image above speaks for itself! Client and prospect meetings are one of the most important part of trade shows. Having a place to sit conveniently, right in the booth, allows your team to make the most of impromptu meetings, in an inviting atmosphere. 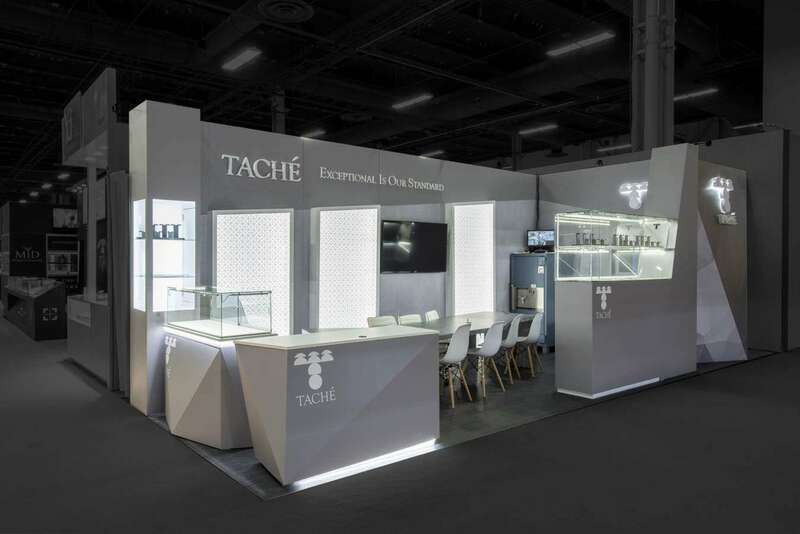 Tache Diamonds combined that intimate meeting space with a look of luxury. Plus, soft lighting made for perfect ambiance in their clean and clear space. Trade Show Tip: Lighting can take booths to the next level and provide an eye-catching space that attracts visitors! Looking for more inspiration? 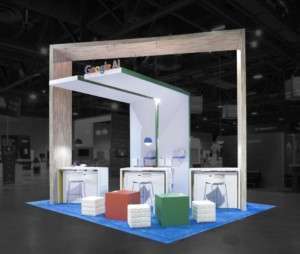 Take a look at our other custom trade show booth design work and see what our clients have to say about their experience with Exponents!